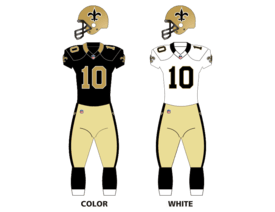 The 2013 New Orleans Saints season was the franchise's 47th season in the National Football League and the 38th to host games at the Mercedes-Benz Superdome. It also marked the seventh season under head coach Sean Payton, who returned to the team after serving a one-year suspension for his involvement in the team's 2012 bounty scandal. The Saints improved their 7–9 record from last season, going 11–5 and making the playoffs as the six-seed. They earned the franchise's first-ever road postseason victory, with a 26–24 win over the Philadelphia Eagles in the Wild Card round, ending the drought at 0–5. However, the Saints were eliminated by the eventual Super Bowl champion Seattle Seahawks in the Divisional round, by a score of 23–15. The 2013 season was also the second time in three years the Saints went 8-0 at home. The Saints did not have selections in the second, fourth, or seventh rounds. They forfeited their second-round selection as part of the punishment for the team's 2012 bounty scandal. They acquired the No. 82 selection in a trade that sent two fourth-round selections, Nos. 106 and 109 overall, to the Miami Dolphins. The No. 106 selection had been acquired in a trade that sent running back Chris Ivory to the New York Jets. The Saints traded their seventh-round selection to the Seattle Seahawks in exchange for linebacker Barrett Ruud. SEA – Steven Hauschka 26-yard field goal, 1:22. Seahawks 16–0. Drive: 12 plays, 63 yards, 4:44. SEA – Marshawn Lynch 31-yard Run (Steven Hauschka Kick), 2:48. Seahawks 23–8. Drive: 4 plays, 62 yds, 1:11. ↑ Chicago defeated Dallas head-to-head (Week 14, 45–28). ↑ The New York Giants and Detroit finished with a better conference record than St. Louis. ↑ The New York Giants defeated Detroit head-to-head (Week 16, 23–20 (OT)). ↑ Detroit finished with a better conference record than St. Louis. ↑ Atlanta finished with a better conference record than Tampa Bay. ↑ "2013 Conference Standings". NFL.com. Retrieved December 8, 2013. ↑ "2013 NFL playoff picture". CBS Sports. Retrieved December 8, 2013.